Leaders Lab / Your Leadership Style / Are you a happy leader? Are you a happy leader? There is overwhelming evidence for the economic benefits for organisations which have happy employees. 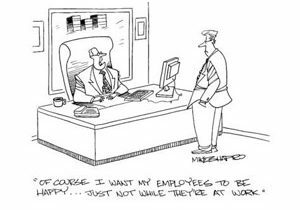 Often places where people are unhappy are places where the leaders are unhappy too – or at least, wouldn’t describe themselves as ‘happy’. Many leaders would say they’re ‘OK’ or ‘fine’, their criteria being the number and importance of the ‘issues’ or ‘problems’ they’re currently trying to sort out. But happy? Rarely. But if you have a choice of being happy and working in a happy environment, why wouldn’t you choose to do so rather than a miserable, bullying, snappy work environment? So where should you start? Creating happiness and wellbeing in an organisation is a leadership responsibility. But how far do you really understand how paralysing it can be for people to work around executives who are unhappy themselves? It is hard to make others happy if you are not happy yourself; authenticity is critical to truly compelling and engaging leadership. And no, annual conferences and work get-togethers do not cut the mustard! No amount of prize-giving, food and alcohol hides the underlying culture of a company. One person we met recently commented, “I see our yearly conference as a very expensive way our leaders say sorry for being so consistently incompetent at creating a great work environment”. So the question is: are you doing enough to make those around you, let alone yourself, happy? A starting point is to find out how healthy your organisation is. This means finding out and feeding back to your leadership group the impact they have on people in the organisation every day, both positive and negative. This is a great starting point to clarify what actions you can take immediately to create a strong positive culture. It may also come as a relief that there are many things you can do rather than just put up with being unhappy at work. The link between happy employees and a healthy, constructive organisation culture is something that is deservedly getting more and more focus. The message is slowly becoming clearer – that as a leader in your organisation, you can make a real difference to the quality of your work life, the happiness of your people and to yourself. So what can you do straight away? In understanding what creates happiness Harvard psychology professor Daniel Gilbert refers to the work of psychologist Ed Diener who “essentially shows that the frequency of your positive experiences is a much better predictor of your happiness than is the intensity of your positive experiences”. In other words, when it comes to happiness we appreciate more frequent moments of joy, even if they are less significant, than incredible single events. If you agree that this holds true in your professional life as much as in your personal life then this is great news. It is the small things that matter and will have a more lasting impact than the one bigger thing that you think you are waiting for. Either way if you are not seizing the seemingly minor, everyday moments to create happiness for yourself and others then you and your organisation are missing out. The opportunity in all of this seems to be to pause and ask yourself, “Have I done enough today to make those I have interacted with happier in some small way?” If you are not satisfied with your own answer, chances are that others aren’t either! Call us on 01865 881056 or email us at info@leaderslab.co.uk if you’d like to discuss any of these issues in more detail.